A coin that a New England man originally thought was a counterfeit has been authenticated by NGC as only the fourth known 1854-S Liberty Head Half Eagle. “It’s like finding an original Picasso at a garage sale. It’s the discovery of a lifetime: a previously unknown surviving example of one of America’s greatest coins,” said NGC Chairman Mark Salzberg. 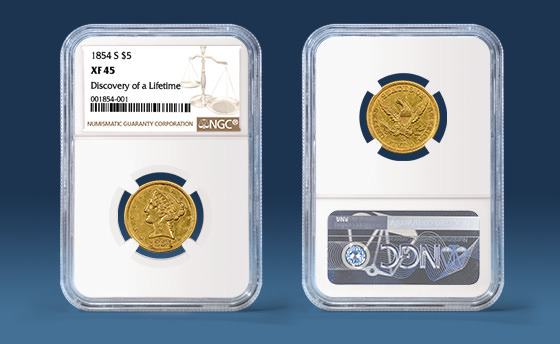 The phrase “Discovery of a Lifetime” was noted on NGC’s certification label when it graded and encapsulated this previously unreported 1854-S $5 as NGC XF 45. Mint records indicate that only 268 Half Eagles were struck at the San Francisco Mint in 1854. One surviving example is in the National Numismatic Collection at the Smithsonian Institution in Washington, D.C., another is owned by the Pogue family of Texas, and a third example has not been seen since it was stolen from industrialist Willis DuPont in Coconut Grove, Florida, in 1967.